You want to know what makes me sad? When I’m in someone’s kitchen and I see their food processor gathering dust in a cupboard somewhere. That’s just a massive waste of potential. Making use of your food processor is one of the best decisions you will ever make in your kitchen. The sky’s the limit for what you can do with one. In fact I would say that there’s actually more uses than you can count. So many different things that you’d never expect. And if you think that your kitchen is already too packed with appliances, don’t worry about it. Small food processors are getting more and more popular. With higher demand, there’s more choices out there. There’s a lot of good options, and there’s some not so good options. But even among the best ones you’ve got to decide which one is right for you. So with that in mind, let’s have a look at some of the different things to consider. Since you’re going for a small food processor, I probably don’t need to tell you that they’re not going to be the most powerful options. The larger food processors are always going to be more powerful, but it’s still something you need to think about. The thing about these machines is that the power doesn’t entirely depend on the motor. That is part of it of course, but the blades and discs are also a factor here. The efficiency and effectiveness of the processing will be higher if you have a more powerful motor. But even the most powerful motor won’t get the job done if the blades and discs you have are blunt, or likely to wear down over time. You’ll soon discover an awful lot of different recipes that you can make with a food processor. For some of them, power is more important. For example, if you’re making nut butter, you can’t really afford not to have a powerful machine. The machine needs to be able to grind and crush the tough nuts, and a weak one just can’t. No matter how long you let the machine slave away at it, it’ll never be smooth. If you’re using it to make ice cream however, lacking a bit of power probably isn’t that big of a deal. That mixture will be smooth anyway. Some of the smaller food processors do actually have motors that are close enough to being as powerful as the big ones, but an awful lot are weak. You definitely need to keep this in mind. You don’t want to buy a food processor only to find out that it’s not up to the task of half the recipes you want to try. Much like the issue of power, I’m sure it will come as no surprise to you that small food processors are lacking in this category. What you should be looking for, is a food processor that is weighted. It’s not uncommon for badly built food processors to wobble all over the place while the motor’s running. When this happens, you run the risk of it falling over or making a mess. It’s even possible that it could topple off the countertop entirely. A lot of big food processors are specifically designed to make sure that this doesn’t happen. They will have a big, sturdy base to keep it steady. And sometimes they’ll even come up with suction cups attached to the bottom of the base. Smaller food processors tend not to be as sturdy. The advantage is that they are smaller, which means they’re less likely to topple anyway. But you do need to keep an eye on picking one that’s well-designed. There will be some brands that put more focus on keeping a steady machine, so keep an eye out for those. Long-term durability is also something to think about. You don’t want to have to buy another food processor in a year’s time. Some food processors which have all the positives like power and design, are known to stop working pretty quickly. This is something that’s definitely avoidable, so don’t waste time on a machine that isn’t going to last you. It might seem like a strange thing to be thinking about, considering you’ve probably already decided to go small. But there’s more to it than space-saving. Of course, that is the primary reason why people pick smaller food processors in the first place. I will sing the praises of food processors all day, but the big ones do take up a lot of space. They take up a lot of space in the cupboard, the take up a lot of space on the countertop and they can be heavy. There’s also usually a bit of setting up to do with them. Getting the bowls and tubes into position and all the blades and discs equipped can be a pain. Small food processors remove most of those inconveniences, but size is still something that you definitely need to consider. The size of the bowl is very important for one thing. Not every brand is going to come with a sufficiently sized bowl. You might think that you’re prepared for how little you’ll be able to fit in the bowl, but you’d be surprised at how limited that could make you. If you’re making hummus and you have an insufficiently sized bowl, you’ll probably have to significantly reduce the number of ingredients. If you’re making a salsa sauce to put on a bowl of pasta, you might end up with barely enough to cover half of it. Get a processor with a good sized bowl. The best ones will be well-designed enough so that you can have a big bowl and still have a machine that won’t take up much space. The size of the tubes that you feed ingredients into the mixture through is another thing. Nothing worse than getting ready to slice a cucumber, only to find that it’s too thick for the tube. So be wary of that. Small bowls and small tubes can really ruin the food processor experience. Even if you are avoiding large machines. Of all the different comparisons you can make between the large and small food processors, this might be the one where the little guy has the big advantage. Though you can sometimes put most parts of a big food processor into the dishwasher, you’ll more often than not have to hand-wash the bowls. It is without question, everyone’s least favourite part of the job. We just want good food, we don’t want to have to spend all night cleaning up after it. Knowing how much you elbow grease is involved is almost an incentive to leave the processor in the cupboard and not make use of it at all. Luckily, if it’s a small food processor you have, the amount of work goes down significantly. In some cases of course, you can put the bowls, the tubes, the blades and the discs into the dishwasher but even if you can’t, hand-washing small stuff is no big deal. All of the small food processors will be very easy to clean, there’s a huge difference in favour of going small in this regard. First good thing to note here, this has got a pretty big bowl for a smaller variety of food processor. It will hold up to 8 cups, and while this is still about half the size of the larger options, it’s enough for a lot of recipes. You could easily still make a good dollop of salsa sauce or a serving of soup. It would make a decent amount of ice cream for a dessert too. It might be a little bit lacking if you were making nut butter or hummus, something that you want a lot of, to be keeping for a longer period of time. For for small food processors, the Hamilton Beach probably has the biggest bowls that you’re going to get. The feeding tube is also nice and wide. You could fit a large block of cheese through it if you were looking to grate. The motor is good. It’s definitely powerful enough to deal with something as tough as nut butter. And it comes with high-quality blades and discs too. The S-Blade, and both shredding and slicing discs are stainless steel. The discs are also reversible and there’s a couple of different speeds so you have plenty of control. It will chop pretty much anything and it’s got durability to match. This won’t pack it in anytime soon. And if all of that is not enough, you can put the bowls, the lids and the blades in the dishwasher. So you get a machine that’s pretty outstanding in all categories, won’t take up much space and is actually very affordable too. Nothing but good news here! The Cuisinart comes in here as our runner-up. Seeing as they were the original name in food processor and are always reliable, you were bound to find this brand pretty high. The only real disadvantage it has when comparing it to the Hamilton Beach is the size of the bowl. This one only has a 3-cup bowl, which is significantly smaller than our top option. But it’s close enough to the standard size for a small processor. So you probably won’t be too bothered by this since you’ve already settled on a small one. It’s actually ideal for your daily cooking needs. If you want to use it chop up vegetables and potatoes for dinner then you don’t need anything bigger than this. But of course it can grate cheese, make bread crumbs, mix a sauce and can make a small amount of nut butter or hummus too. All of the blades and discs are stainless steel here too which is great and the motor definitely isn’t weak. Much like the Hamilton Beach, it’s very easy to clean as everything is dishwasher friendly. And it’s very affordable too. Not to mention it’s tiny. This will take up no space at all. And it’s one of the most durable food processors on the market. No negatives here either really. It might be a little bit too small for some people’s needs but other than that it’s pretty perfect. Great product this one. Roughly the same size as the Cuisinart, the KitchenAid has a 3.5 cup working bowl. It’s the perfect size for daily use in the kitchen. It’s compact, it’s lightweight and it’s well-built. This won’t topple over and it will probably last you a long time too. Considering its size, it’s pretty surprising that they manage to fit so much into it. It’s got a locking blade, a handle, a spout for easy pouring, a cord wrap. It definitely uses the limitations of its size to their full potential. Having said that, it doesn’t have as much variety as the other choices. 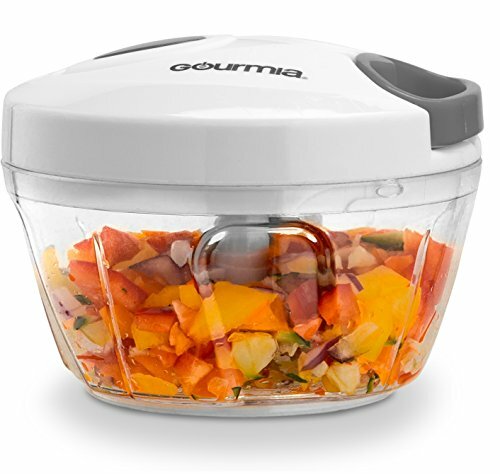 While you can use it for chopping vegetables, blending and making butters, it doesn’t have the capability for some of the more complex recipes. For examples you wouldn’t be using this one to make bread crumbs or to slice up a cucumber. It’s not the type of food processor that is equipped with a few different functional discs. This is mainly for blending and chopping. 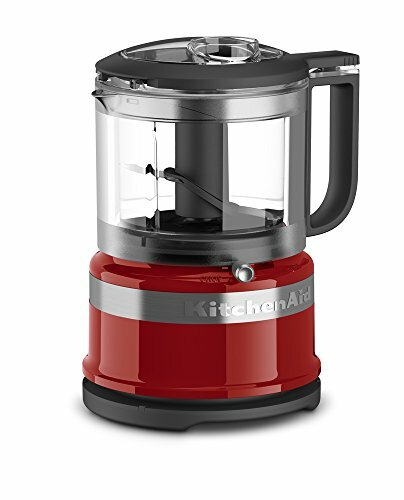 It’s not limited to one specific function like a standard blender or a standard chopper but if you’re looking for a very versatile appliance this isn’t it. That said, what it does do, it does very well. And on top of that, it’s also entirely dishwasher friendly and doesn’t cost a whole lot either. For what it is, it’s a great choice. And will probably suit a lot of your cooking needs. Nope this isn’t a mistake. There are in fact two Cuisinart products on this list. 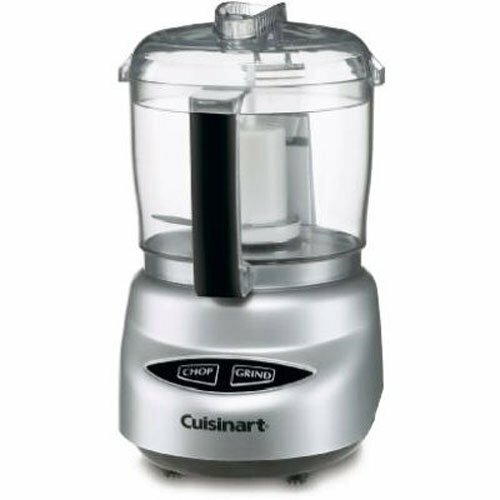 The name Cuisinart is synonymous with food processor after all. 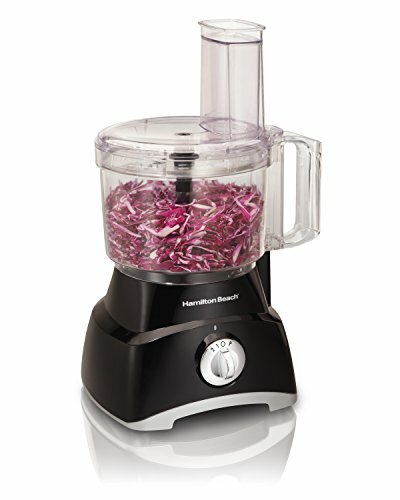 A bit like the KitchenAid, this is another food processor that isn’t great for variety, but does some stuff very well. 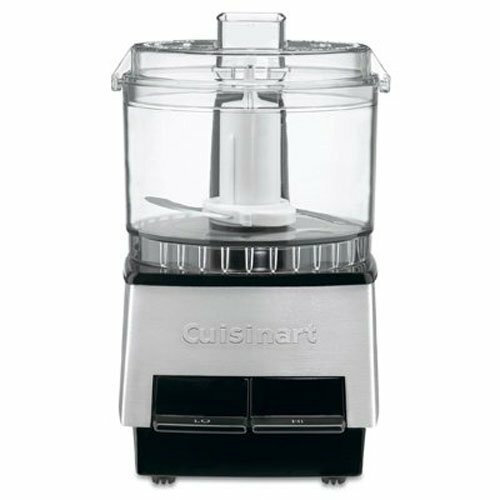 It will chop, blend and grind all day long with that typical Cuisinart reliability. Very well designed, very durable, and of course it’s tiny. It’s not tiny to a fault though, the bowl is still big enough for your chopping and blending needs. Everything is stainless steel from the base to the high-quality blades and everything is also dishwasher safe which as you know is a massive plus. And this actually comes with a recipe book too. So if you’re stuck for ideas, Cuisinart is not going to leave you high and dry. So this is an excellent little device. When in doubt, you can always look to Cuisinart. This is by far the most compact, and by far the cheapest product of the bunch. And while it might not look like much, it’s a deceptively useful machine. It’s great for dicing, mincing and chopping and although it’s small, the motor is surprisingly strong. The blades are also stainless steel and top quality and it’s extremely easy to clean. You can stick it in the dishwasher if you want, but you could hand-wash it in seconds. Of course, like some of the other choices here, it’s no good for the more taxing recipes, but that’s not the appeal. The appeal of this one, is the fact that it’s tiny and it will hardly cost you anything. Don’t judge this book by its cover. The Gourmia has got a lot going for it. So in short, you can absolutely get most of the benefit of a food processor without sacrificing too much space in your kitchen. And there’s several different products out there, each of which offers something different to suit your needs.